The 14th this week will mark a birthday of sorts. 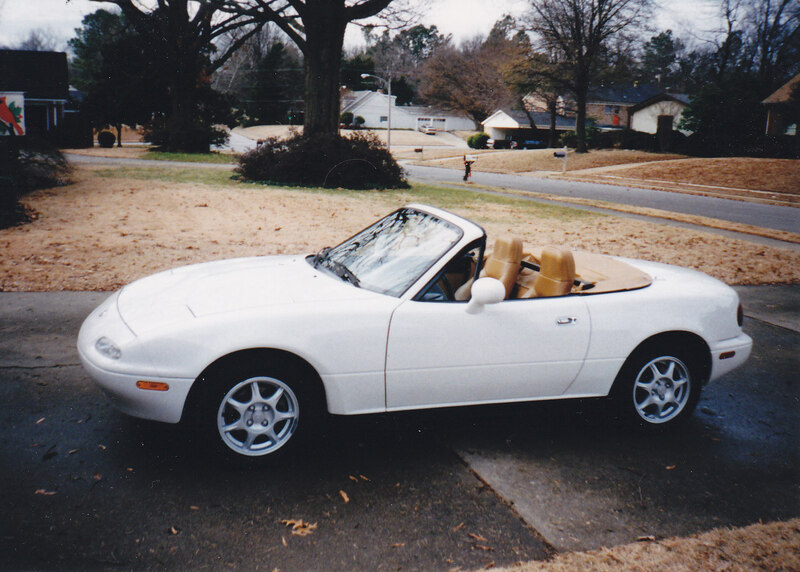 It will be 20 years that I have owned my white 1994 Mazda Miata, affectionately known as “the Marshmallow” (so named by one of our artist friends for its toasted tan colored top over miniature white body). This is a significant milestone for me since I have owned and driven cars for over 44 years but have never owned the same car for 20 years. But no less significant is the fact that the car itself is now 23 years old (based on model year), and just two years shy of qualifying as an antique car. 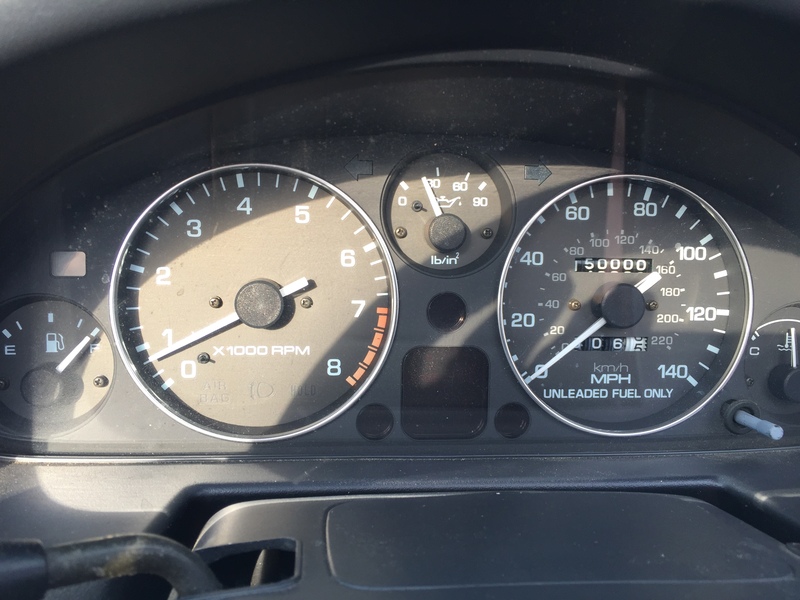 The Marshmallow turned over 150,000 miles this year, not an excessive amount for a 23 year-old car, and I thought for its 20th birthday with me that it would be fun to look back over how it accumulated all those miles. I bought the car used in December of 1996, the year I turned 40. It had less than 10,000 miles (9,536 to be exact), which was not bad for a car that was 3-model years old when I bought her. For the next five years, she became my daily driver, providing me transportation for my commute back and forth to work as well as all of the errands I ran on the weekends. It made a couple of trips to Hot Springs, Arkansas, where my parents lived at the time but other than that, it was all local miles. 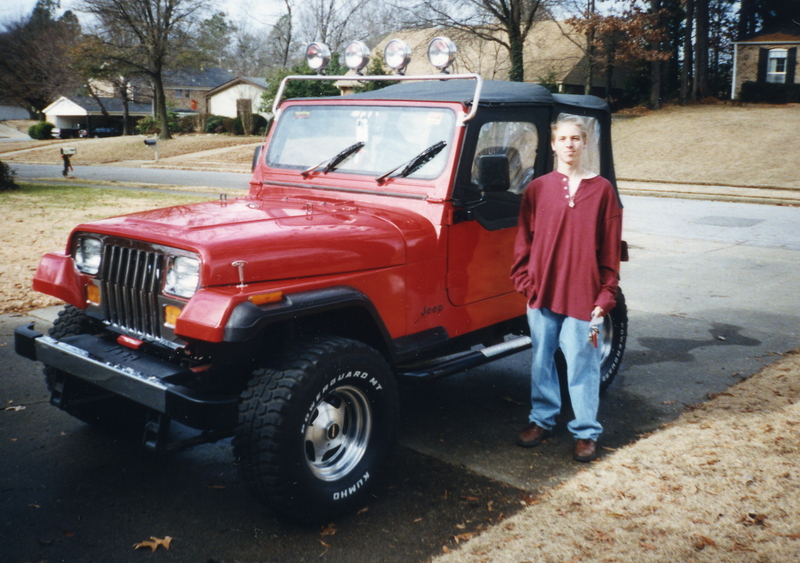 That all changed in January 2002 when my oldest son needed to replace his 1989 Jeep that had died. 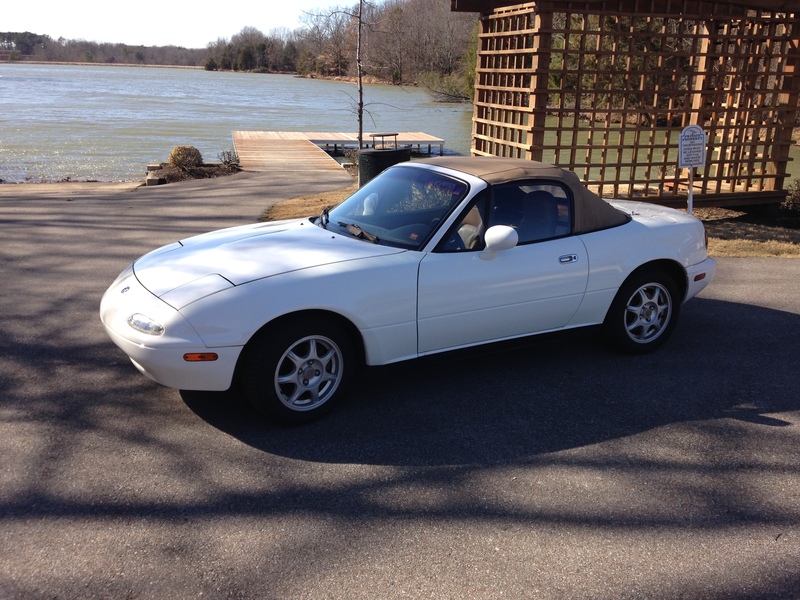 That was when I offered to let him “borrow” the Marshmallow and I bought myself a new 2002 Miata. At that point, the Marshmallow moved to Atlanta with him where he was in college at the time. While at college with my son, she made a couple of road trips, once to the mountains of western North Carolina and once to Key West, Florida. And she would also provide his transportation home from college on holidays and summer breaks. Interestingly at the time, I discovered on Google earth that the Marshmallow had been captured in the satellite image parked on our street and at our son’s house in Atlanta, giving the impression that it could be in two different places at the same time—maybe a magic car? After our son graduated from college and he moved to Austin, Texas for graduate school, the Marshmallow went with him. Over the three years our son was in graduate school, I lost track of the trips they took together so that part of her car life remains a mystery to me. I seem to think she might have made a road trip to Mexico during that time but I don’t know for sure. What I do know is that after our son graduated, he left her in Austin as he was moving in a U-Haul truck to the San Francisco bay area for his first job. 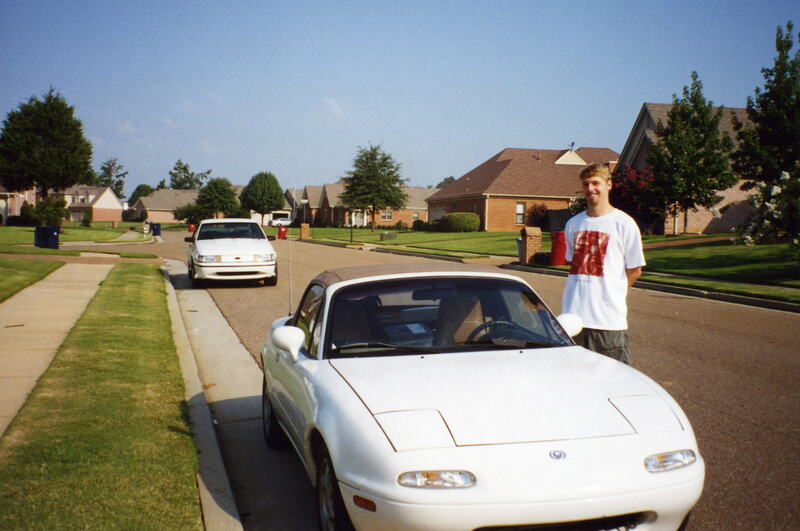 I then had to fly down there and drive her back to Memphis, the prodigal car returning home. With her back home, I now had a choice of “red or white” for my morning commute into work. At least that is until my youngest son decided he would like to “borrow” her for his weekend car and took her to his apartment in town. During this time, other than running around town, her big road trip was back to North Carolina in the hands of my brother-in-law and nephew when they had to return home while the rest of their family stayed with us. 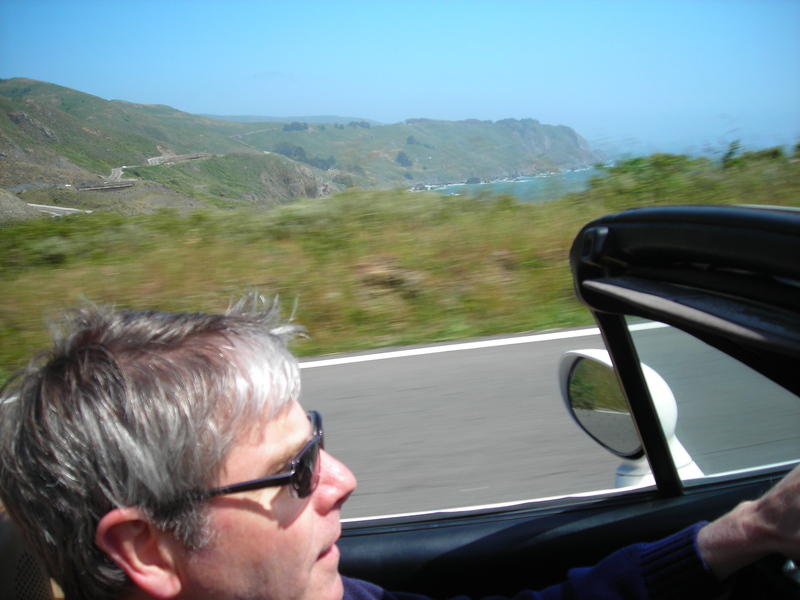 Then in 2007, my oldest son decided he would like to borrow her back so he would have a car in San Francisco. That year, he rode the train home for Christmas and in January drove it back to San Francisco. This was probably her longest road trip ever as Memphis to San Francisco is almost 2,100 miles (via I-40). On this trip, she really got a chance to see the country. While she was a California girl, I would get to drive her whenever we were in San Francisco visiting. 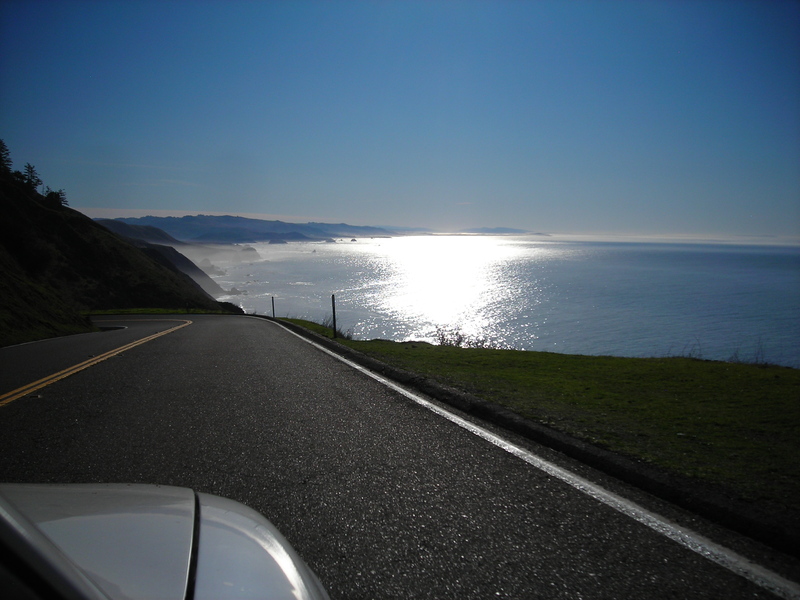 This included multiple top-down drives on the PCH (Pacific Coast Highway), as well as trips to Sea Ranch where our family gathered for Thanksgiving a couple of years. 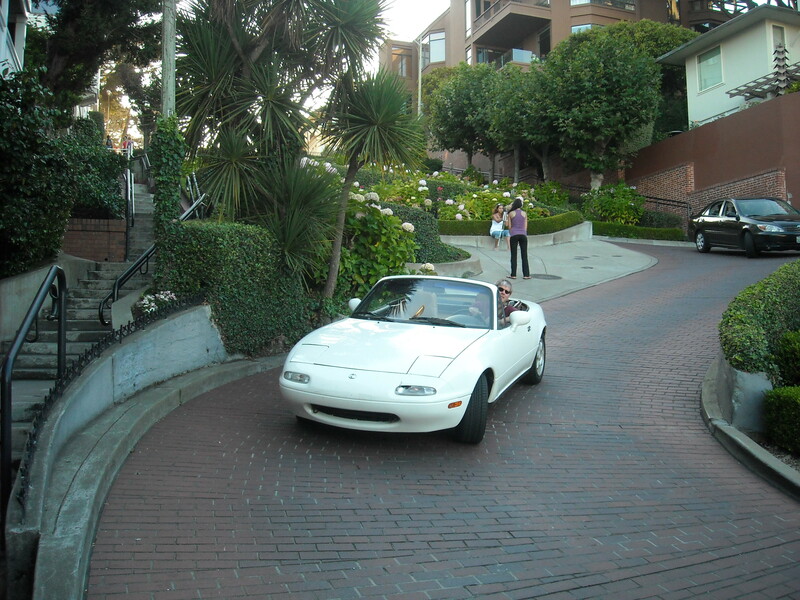 And one year, I even got to drive her down Lombard Street in San Francisco, the crookedest street in the world. This was before the San Francisco Fire Department ran into her while she was parked on the street. The damage almost totaled her but not quite so. Now she has a new driver-side door, which is hard to close, a continual reminder of her time in San Francisco. Then in 2011 after our son got married and he and his new wife moved to New York, we had her shipped back home to Memphis, the prodigal car returning a second time. The day my wife dropped me off in the parking lot after her long cross-country journey on a car carrier, I was really glad to see her again. I drove her to work that summer day for the first time in many years. 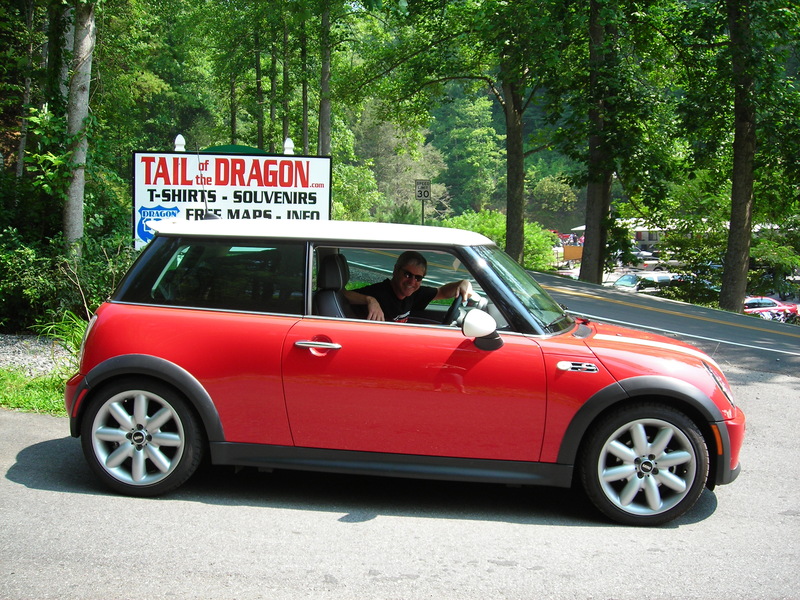 But on her return home that day, she was now greeted not just with a sibling Miata, but now a 2006 Mini Cooper S as well. So now I had a choice of “red or white” or “red and white” for my daily drive into work. At least that is until my youngest son decided to borrow her back and keep her at his apartment. While he kept her, her one road trip was when the two of us drove up for the day to the Corvette Museum in Bowling Green, Kentucky. 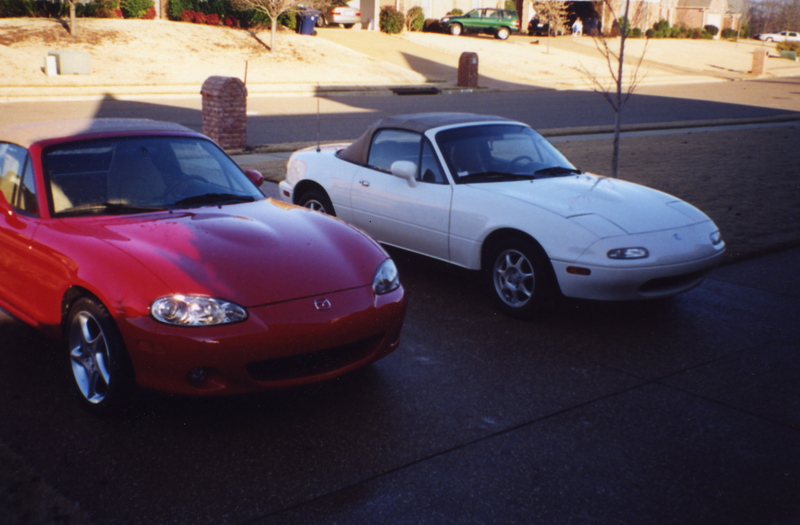 Almost 20 years old at the time, I wanted to see how she performed out on the road. She did just fine. 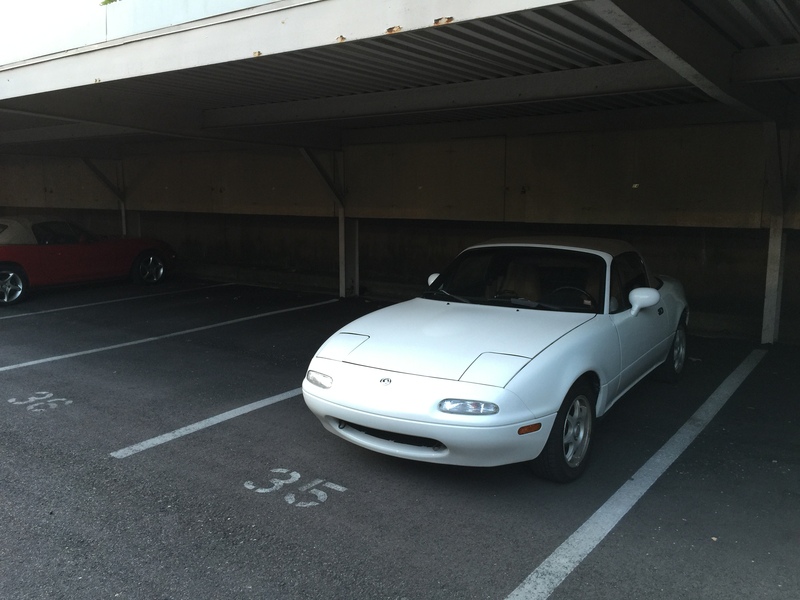 Once our youngest son had his daughter, a Miata was no longer a practical second car to have and so she returned home once again—although this time it wasn’t to home but rather to our mid-town condo where I had a reserved, covered parking spot for her. And this is where she lives now. Whenever I stay at the condo, I use her as my fun run-around car on errands or just out for a drive. Since she is 23 years old, she certainly has her share of squeaks and rattles. But when the weather is nice enough to put the top down, I get to hear her iconic exhaust note. My plan is to keep her at least until she becomes an antique. No longer being my daily driver, she won’t rack up the miles over the next several years like she has in her first 20 years with me. In fact, she has belonged to me for so long; I just don’t think I can ever sell her. Who knows, in a few years, one of my sons may decide to “borrow” her back. 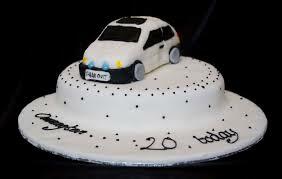 Or even more exciting, maybe one day, one of my grandchildren will want to borrow her as his or her first car. At that point she will have become a 3-generation car, all in the same family! This is such a cool idea! I should write one about the green Honda–she has seen so many trips and life changes in her…17 years! She is almost not a teenager too. 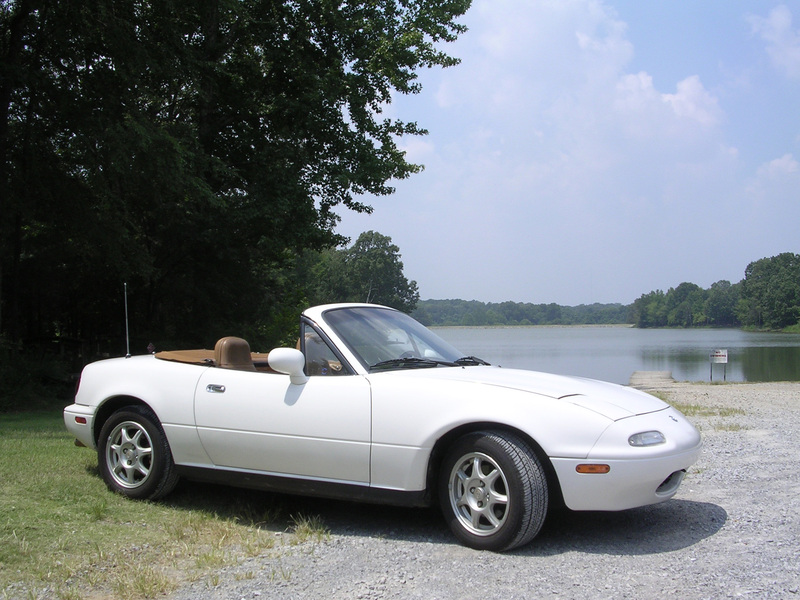 This is a great story of all the Marshmallow’s adventures, but you might not have realized that it is also a story about your great generosity–sharing your very first sports car with anyone who needed her. You sweet daddy! Thank you sweet girl, I suspect the Marshmallow would love to hear your Honda girl’s stories and I know I would too! What a sweet little post! i hope she last many more years! Thanks! I guess you could say I have been waiting 20 years to write this post. onecreativescientist No Longer a Teenager!